Almost one year to the week ago Square Enix did something that shocked many, announcing a follow-up to FINAL FANTASY XIII before the other two XIII titles – announced alongside the original – had even shipped. As one of the most polarizing entries in the series to date, for better or for worse FINAL FANTASY XIII was getting the sequel treatment. To tell you all the truth, I wasn’t exactly thrilled with this news. Like many others, I was disappointed by the original title. It wasn’t that Final Fantasy XIII was a bad game – it isn’t – it was more that it failed to live up to the expectations set by rest of the series and a massive development cycle. Square Enix is definitely aware of that opinion, and in interviews XIII’s producer Yoshinori Kitase has repeatedly stressed that lessons have been learned. That’s evident in the game, too, as the team has clearly gone out of their way to address every major complaint about XIII in this sequel. It’s only fitting that we tested the game thoroughly, and so I played it 100% through to give you all a proper review. What did they fix? What’s new? Is this game really that much better than FFXIII? After 65 long hours – 25 with the story and the rest spent on optional gameplay – I’ve completed the game 100% with all 160 Fragments. It’s finally time to weigh in. Final Fantasy XIII-2’s story has a fairly simple and familiar premise. Those who for some reason didn’t play the game will be able to view a Beginner’s Primer which chronicles each chapter of FFXIII in narrated text form. The original game saw the bulk of the plot revolving around ‘main character’ Lightning and her battle against fate to save her sister, Serah. In XIII-2 those roles have been reversed; Lightning has gone missing and it’s up to her sister and a mysterious man named Noel to find her. Lightning has been trapped in Valhalla – known as the Invisible World – by the result of a time paradox. As a knight she is granted powers by the goddess Etro to which Lightning becomes a protector. It’s all a bit wordy and loaded with lore, but that’s just the beginning. 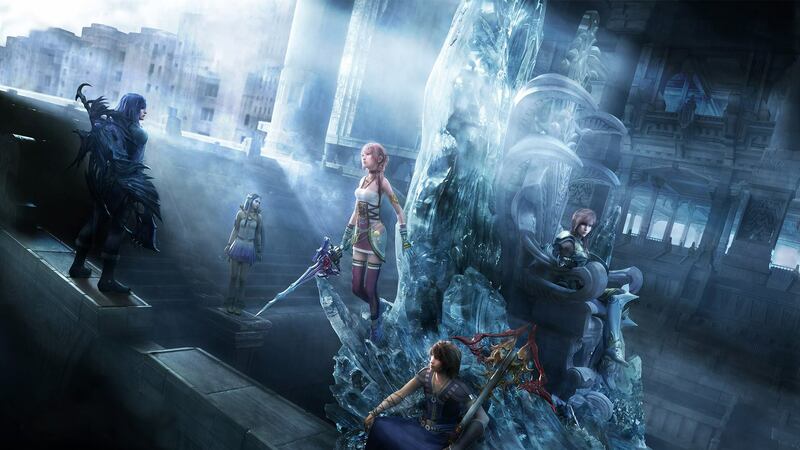 Three years after the events of FFXIII, Lightning recognizes a sadness within Valhalla. A dark man of the name Caius Ballad soon appears and the two clash in an on-rails and CGI battle of epic proportions. As sword meets sword, a gate opens over Etro’s shrine revealing the figure of Noel Kreiss. A miracle has sent him there from his own dying world, and Lightning acts quickly to save him despite being under a never ending pursuit from Caius. Unable to leave Valhalla herself, Lightning tasks the young Noel with finding Serah, sending him off with a Moogle before Caius calls down a meteor to destroy the shrine. Noel jumps into a time gate at the last moment, signaling the beginning of his adventure. Noel doesn’t have to do much to find Serah, and upon meeting her Noel reveals to her that he is in fact from 700 years in the future. As the only one who believes her sister is still alive, Serah agrees to go with the wayward traveler to destinations and timelines unknown with the ultimate goal of finding Lightning and a future where everyone lives. Throughout the story, you’ll encounter both new and familiar faces with both Snow and Hope fulfilling large roles in particular, but the cast of the original game is overall used in a disappointing way. XIII-2 definitely has a lot of interesting ideas packed into its story; In fact, there were many moments I felt had the potential to be quite moving, standing up there with some classic Final Fantasy moments – but unfortunately nearly all of them fall flat, especially towards the end of the game. It’s tough to explain this stuff without spoiling the game, but I can say that those looking for a resolution to the stories of the characters from XIII or XIII-2 will be sorely disappointed. Final Fantasy XIII characterized its core cast well but otherwise had a flat story that lacked a strong villain or sense of urgency after the first few acts, which in turn lowered my expectations for XIII-2, also written by Motomu Toriyama – but even lowered expectations aren’t enough to positively color this messy narrative. By and large the story is the worst part of the game, with much being completely nonsensical. Often times things don’t make any sense, and when they do it all seems to lead to a convenient ‘resolution’ which explains away that the strange backflips the narrative had to do to make something happen were all the fault of a Time Paradox. Lack of satisfaction with the story was one of the things that drove me to finish the game 100% after my initial 25 hours with the main story, but the additional hidden endings, paradox endings and extra fragments fail to provide any real insight to what on earth was really going on. As with XIII, large chunks of the lore are left to be explained in the boring format of the Autoclip – Datalog in the West – walls of text you can read off the in-game menus. This is poor delivery, but what it’s delivering isn’t terribly compelling in the first place. Despite all that, Noel and Serah remain a decent cast on their own. Sure you only get to play as Lightning for all of 10 minutes of the entire game, but not once did I ever see an issue with that. At first I was afraid Serah would ruin the game for me, but honestly she’s not all bad. I really liked the addition of Noel. He’s a strong character, if a little cliché, but makes up for it with a positive attitude and being a much better protector than Snow. I would have liked to see the story revolve a little more around him as I was always looking to see where his, along with another new character Yeul’s tale would lead next. Noel shines, but the story of XIII-2 adds up to largely be a negative – be thankful, then, that FFXIII-2’s game design is where things really start to get better. It starts as a mixed bag but battles in particular really start to shine. This is the area where the game’s developers have really taken the criticisms to heart, flying in the face of the quality of the arguably worse than FFXIII story with major and significant gameplay improvements. Long gone are the restrictive corridors of its predecessor and in its place are far more expansive locations featuring talking NPCs and side quests that many argue should’ve been in the original XIII to begin with. The game isn’t entirely open, however. Similar to FINAL FANTASY X and X-2, XIII-2’s world is laid out on an ‘overview map’ of sorts called the Historia Crux. Aside from making time travel possible, the Historia Crux allows you to go between locations whenever you please. Because you travel to areas directly through the Crux there’s a lack of cohesion in the world, but it does allow for you to travel from one vastly different area to another very quickly, allowing for a more exciting and varied world with vastly differing artwork. In any given location you have the ability to press Start and teleport back to the Crux, and should you travel back, your characters will appear in exactly the same place you left from. It should also be noted that every time you return to the Historia Crux, the game will auto-save. For the first time in a Final Fantasy ever, you can save wherever and whenever you please. The game is peppered with both new and familiar locations that have largely been expanded from FFXIII, however the overall layout of the game’s maps tend to stay the same regardless of the time period you’re in. Unlocking new locations is fairly simple. Throughout the levels you have the ability to collect ooparts – artefacts in the English version. Gates that aren’t connected to the main story must be unlocked using Wild Ooparts, which can be found scattered around various locations. Typically each “area” has at least one although they’re not always in the most obvious of places. Using the newly-added ability to sniff out treasure with Mog, Serah’s Moogle companion, you’ll be able to find these hidden items and more. In addition to ooparts FFXIII-2 rewards the user for collecting items called Fragments. There’s 160 total throughout the game and a large majority of them come from completing various side quests, puzzles, or story events. Collecting all of them isn’t exactly easy, but no given number is required to complete the main story scenario. By completing specific ones you’ll have the ability to visit the Gold Saucer-like Xanadu (Serendipity in the English version) and obtain Fragment Skills. Fragment Skills are nice little bonuses that let you play around with some of the game’s usually hidden-under-the-hood mechanics. For instance you can turn the enemy encounter rate up or down, change the default Chocobo theme from that awful metal version or even give yourself a skill similar to the CP growth egg from XIII. Since the game allows you to rewind time and redo each cleared location, going back with said skills gives you a chance to change things up a bit, or finish collecting all items or endings. A lack of sidequests other than faceless, soulless monster-hunt missions were another major criticism of XIII. XIII-2’s are a marked improvement but still clearly have a bit to go – while they’re now actual quests from NPCs with back-stories, the vast majority of them consist of merely finding items for specific people. Essentially, you’ll receive the request, run to one side of any given map to find it battling as you go before coming back and getting your reward. Luckily you get a decent idea of where to find it but sometimes said items can be a bit out of reach, and some quests will even have you traveling between eras and back to fulfill them. In one location, you can even take quizzes based around the lore of world – be careful though, as the questions aren’t always so simple! The more complicated quests that required more effort were definitely more satisfying than the simple ones. Another complaint from FFXIII has been partially addressed – the lack of traditional shops. While FFXIII-2 doesn’t have traditional shop buildings in towns you can go inside, there is a single vendor who dresses in a rather scantily-clad Chocobo outfit that now somehow follows Serah and Noel through time and space. Her function is similar to the travelling Moogle Stiltskin in FFIX or FFX’s O’aka, but unlike those games there are still no traditional shops to be found. Upgrades to your weapons are now all purchased through the shop, and generally this resembles traditional FF more than XIII did, and takes a system from XIII that wasn’t working well and completely changes it. Concepts from the old weapon upgrade system show up in how you upgrade your monsters. Mini-games are back in XIII-2, having skipped out on the previous title. You have a few options here: Chocobo racing and slots at Xanadu and various time labyrinth puzzles that tie into the story progression. The casino isn’t as important or central to the plot of the game as FFVII’s Gold Saucer, merely existing to act as a break from the main core of the game. Why not take a break from the hard toils of battle? That’s exactly what Xanadu was built for. Downloadable content will later introduce coliseum challenge battles and eventually a card game to Xanadu as well. The time labyrinth puzzles are puzzling, but not in the sense of being challenging – they just feel mostly unnecessary. At first I found them decent, but after doing them over and over, they just ended up tedious and tired. There are at least three different types of the puzzle in the game, offering variety, but that just highlights that by far the worst offender is the clock-based puzzle. I’d really like to talk to whoever designed this about the design process because it’s not fun at all. It takes away from the game, and the worst part is you can’t skip it. It’s never good when you dread doing something that’s supposed to be fun. Puzzles elements are fine, but not like this. What about the core of Final Fantasy, the battles? If you played FFXIII you’ll already know exactly what you’re getting into at a base level in terms of gameplay. The Active Time Battle system is back, but with some minor but important changes. Cinematic Actions – a QTE-like system that requires you to press specific button prompts within a time limit – have been added to mix things up a bit. They perform a similar function to pulling the triggers during combat in Lost Odyssey, a deliberate attempt to keep players engaged when not selecting an option from the menu. In what I think is a very wise design decision there’s absolutely no penalty that’ll ruin battle progress for failing Cinematic Actions, though. You’ll never see a Game Over screen for failing to press X or waggle the stick left or right in good time, but scoring a perfect run will net you some good extra loot. XIII-2 also has an element called Paradigm Tuning, which allows you to set your characters up in several attack styles (Normal, Wide, Cross) that affect ally AI in battle. In a game where you only ever have direct control of one party member it’s a huge and very welcome refinement to the system. Battles have also been sped up somewhat with the exclusion of Paradigm Shift animations. In the previous game shifting roles meant sitting through unnecessary animations that would often take away time from finishing enemies quickly. Switching roles in XIII-2 is much more fluid and keeps battles fast and fun, and in my opinion really improves the overall experience. The biggest change to XIII comes in the shape of the player’s party. It’ll still consist of three characters at any given time, but only two of those are traditional cast members. Serah and Noel are joined at all times by a Monster Ally – literally a monster you summon in to aid you. Monsters can be captured through normal battles and then upgraded and merged depending on your needs – which is where elements of FFXIII’s original weapon upgrade system rears its head, with monsters using components you pick up in the field and after battle in lieu of experience points to advance through their own personal Crystarium. It’s a far better use of loot than XIII’s weapon upgrading. The Crystarium itself felt much more easy to use this time around. With CP a lot more easy to come by (and enemies actually dropping gil for that matter), upgrading as I pleased was something long missing from FFXIII. What a relief it was to be able to level up at my own pace with no chapter-based cap to restrict my characters. As such, the Crystarium has the ability to level up once you unlock far enough. Every time you reach a new level, you’ll be rewarded with a prize of sorts. The game gives you the option of choosing between several upgrade abilities including things like increasing your ATB level, learning new roles, or even increasing effectiveness of already existing roles. Both Noel and Serah are also able to get all 6 Paradigm roles early on unlike XIII, which didn’t open up until much later in the game. Square Enix have made another particularly welcome change to the party set-up – the ability to swap party leader during battle. This means you can switch from controlling Noel directly to controlling Serah, and also means you no longer face game over for the death of the party leader. If the party leader is reduced to 0 HP, the game will automatically switch to the other and give you a chance to revive and heal – top marks for that. With XIII-2’s Crystarium leveling system completely open without story-point barriers this time you may find yourself off fine without them, but monster allies do provide a good side component to the core pair who make up the basis of the cast. Both Noel and Serah’s roles each max out at level 99, and if you’re shooting to complete the majority of the game that can be gotten to fairly easily. Regarding roles, Noel is strongest as an Attacker/Defender and Serah as a Blaster/Jammer. Monster allies add a level of strategy that can go so far as to essentially break the game if you try hard enough – something that was impossible with XIII yet also feels somewhat welcome here. Specific monsters will often perform better in some roles than Noel and Serah can, so it’s important to build Paradigms that make use of monsters that fit into roles well. This will help you to deal better damage, and the 150-plus monsters on offer mean you have a lot of options and varieties of team at your disposal. If you work hard at it it’s quite possible to create and level a monster that can completely tear apart everything, although when growing them you have to be careful since some monsters can only be captured once. Something about this breakable, wide-open system is reminiscent again of older Final Fantasy titles. Compared to FFXIII’s deeply controlled Crystarium system the manner in which careful planning can lead to ridiculously over-powered monsters is reminiscent of some of the crazy stuff that could be done with Materia, the Junction System and the Sphere Grid – and I think that’s a good thing, even if it’s game breaking sometimes. The people who enjoyed creating crazy sphere grid paths in FFX or ‘Carding’ every enemy in FFVIII will have fun here. The battle system also introduces two new mechanics called Blood Damage and Synchro Drive. Blood Damage is a specific type of infliction that depletes the maximum HP for the duration of a battle. Both enemies and your party members alike have the ability to use it and it can definitely make a battle harder to deal with – but luckily there are potion items than can repair the damage done. Synchro Drive is a monster ally ability that requires a gauge to be built up over time. Once activated the monster will perform its unique special move that is usually a little bit reminiscent of FFXIII’s summons, absent from this game, and usually involves some sort of QTE button combination. Other new gameplay tweaks include the addition of jumping outside of battle to explore and the new ‘Live Trigger’ system. Serah and Noel’s ability to jump offers up a first for the main-line Final Fantasy series – platforming segments. These are sometimes frustrating and sometimes unobtrusive, but for a first foray into this XIII-2 doesn’t do badly. The Live Trigger system is XIII-2’s version of a dialogue choice tree – Square Enix has obviously been paying attention to Western RPGs. During cutscenes or key moments the action will stop and you’re asked to pick one of four choices of how to respond or proceed. Almost all of the dialogue choices have very little impact on the story, so if you chose a “wrong” answer, you’ll often have the ability to correct it, but it will result in marginally different minor dialogue and potentially allow you to take on extra side-quests, offering a vague sense of consequence without taking away the level of developer control traditionally exercised over Final Fantasy stories. This isn’t a morally challenging game, but the choices you can make can have some fun outcomes. Although most of the core systems from XIII are in place and past errors have been fixed, the new additions have bought some flaws with them. Most notable is the fact that the game is far too easy, even on Normal mode. Even without grinding it’s fairly easy to reach level cap early on in the game for two or three roles per character. As you might expect, this makes the majority of battles really easy – so much so that I was able to breeze through most encounters until the final boss fight. It’s nice that they left the Crystarium unrestricted, but with the encounter rate so high on normal enemies, it’s no wonder I was able to coast through a good portion of the game. One other major issue is the exclusion of certain abilities from Serah and Noel’s Crystarium. Neither character can learn speed buff or debuff abilities such as Haste or Slow, for instance, and roles like Enhancer are relatively useless to the game. Overall role relevance has largely decreased thanks to the focus on Monsters – Jammer and Defender are fairly unnecessary to use during the story portions, and only work well against certain enemies late in the game. These balance changes have been made to increase reliance on the new Monster systems, but do not go far enough to ensure you must use them. In their place you have what is called the Mog Clock which is essentially a gauge that allows you to trigger a preemptive attack or face penalties depending on certain conditions. Enemies in XIII-2 appear randomly instead of already being on-field like XIII, and as such you’re given a limited amount of time to strike them or escape before the battle begins. Successfully landing a strike in the green zone of the Mog Clock gives your party Haste at the beginning of the battle, whilst Yellow will lead to a normal battle and Red will give the Enemy buffs and you debuffs. Outside of some monster abilities, it’s the only way to use Haste in the game. Such a step back really didn’t make much sense to me, especially when the developers have always emphasized speed when talking about XIII’s battle system. The Mog Clock is also flawed in that enemies often appear in restrictive corridors where battle is difficult to avoid – and the encounter rate in some areas is far too high. There’s no doubt that FFXIII-2 is a good looking game, though where it stands next to its predecessor in this area is debatable. Gone are the pre-rendered sequences from XIII – but that comes at a price. On a technical level, the game sadly doesn’t look or run as good as XIII did. Graphically it doesn’t seem as polished and struggles to maintain a solid framerate in both on-field gameplay and cutscenes. I suppose that’s what happens with a shorter development cycle, but it’s disappointing knowing that the team is capable of far more. CGI sequences still exist, albeit with less frequency. For those curious, there’s about 5 in total including the opening and ending, as well as a few others in between. As expected of Visual Works, they are as clean, lengthy, impressive and detailed as ever. Shorter development time is also evident with the amount of asset recycling going on. This was the case from FFX to X-2, but here it seems more pronounced. XIII-2 appears to feature no new enemy designs that weren’t in the first game aside from boss-type enemies; and even some of those have been ripped straight out of its predecessor. Menu design stays relatively familiar to FFXIII, though there are small cosmetic changes like the switch from CG status windows to in-game models to represent the characters on the status screen. Maps and levels also suffer from this, with several levels coming straight from XIII, and others recycling layouts despite changes in weather and time period via different timelines. Welcome changes to the graphical components of the game really shine through in new animations. I felt that as a whole, both Noel and Serah’s modeling were quite good compared to some of the gameplay models that were present in XIII. Both characters have a lot more subtle animations and reactions that give them much more realism. Pay attention to the way Serah’s hair moves. It’s a lot more fluid and realistic this time around. She’ll also wipe her forehead once in a while having run for quite a distance. In battles, too, you’ll see a lot more complex moves, namely with Noel completing some pretty impressive flips and sword play. It’s little things like these that really add to the immersion of XIII-2’s world. While assets have been recycled in some places, music is one where there’s a solid mix of old and new. For XIII-2 Square Enix decided to tap into the talents of three different composers for the game, and the result is simply amazing. I have no problem saying that the soundtrack is one of the best parts of the game, even with clunkers like that metal Chocobo mix. Some tracks are definitely better than others, but as a whole I find myself listening to specific themes more so than I did with XIII. Most of the vocal tracks are very pleasant and good enough to listen to on their own. Various tracks from the previous game appear in key locations, but they feel like they’ve been carefully picked to add a sense of familiarity to the game depending on the situation. Final Fantasy XIII-2 is packed to the brim with good ideas, but just like its predecessor quite a few of them suffer from poor execution. While it’s clear the team took feedback and applied a good portion of it to the game, there are still issues they missed and areas where their response actually bought new problems of its own. FFXIII-2 is the kitchen sink – it feels like the team tried to put everything into the game – so much that not all of it fits together in a cohesive manner; not all of it actually works together. Coupled with the lackluster story, perhaps XIII-2 was simply rushed – 2 years for a Square Enix Japan game is an awfully short period of time. With all that said, these are all notably nagging complaints. There’s a lot to celebrate here and a lot done right – including what I’d argue is something of a major series milestone – the team at Square Enix listening to fan feedback and directly implementing it into the game. After XIII, a game that seemed to throw the baby out with the bathwater when it came to series tradition and lore, the team seem eager to bring back many of the stronger elements of ‘classic’ Final Fantasy, and the game is better for it. Flawed as it might be, this game is a definite improvement over Final Fantasy XIII. While it doesn’t correct every flaw from its predecessor and brings a few new ones of its own, Final Fantasy XIII-2 takes several steps forwards to be that much closer to being the game that the original should have been all along. Disclaimer: Played to 100% completion using the final retail Japanese PlayStation 3 version of FINAL FANTASY XIII-2. Read more about the Nova Crystallis review policy here. Posted in Final Fantasy XIII-2, Reviews, Special.